Vietnam has successfully contained its outbreak of Sars - the first country to do so, the World Health Organization said on Monday. The WHO said the pneumonia-like virus had also passed its peak in Canada, Singapore and Hong Kong, but not in China - where Sars first emerged last year. Vietnam - one of the first countries to be hit by the pneumonia-like Severe Acute Respiratory Syndrome - has not reported any new cases of the disease since 8 April. Under WHO rules, Sars can be declared under control and travel advisories lifted when 20 days have elapsed since the last infection was reported - double the incubation period for the disease. As Vietnam's apparent success was announced, Indonesia recorded its first probable Sars death - of a Taiwanese businessman in a Jakarta hospital. In other countries, too, deaths from Sars rose over the weekend. Hong Kong announced 12 new deaths on Sunday, and mainland China reported nine. The number of deaths worldwide is now well over 300. The authorities in Canada - where 21 people have died from Sars - said they would be holding an international conference later this week to discuss the virus. The WHO praised the Vietnamese Government's "strong commitment at the highest level from the beginning of the outbreak". "Vietnam has been able to show the world that there is hope that Sars can be contained," said Pascale Brudon, the WHO's representative in Hanoi. Vietnam was initially seen as one of the countries worst affected by the virus - and five people died out of a total of 68 reported infections. However Vietnamese Health Minister Tran Thi Trung Chien on Monday warned against complacency. 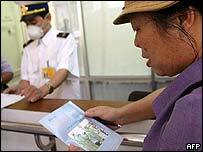 "The threat of Sars importation to Vietnam through international travel is great," she said. She has reportedly asked Prime Minister Phan Van Khai to authorise a temporary closure of Vietnam's land border with China, the country worst hit by Sars. China's capital Beijing is still fighting an escalating Sars crisis, and the authorities are continuing to step up measures to contain the virus. An estimated 8,000 people are now under quarantine, and the city has shut down what the official news agency called "all entertainment businesses involving mass public gatherings" - cinemas, theatres and internet cafes, as well as schools. BBC correspondent Rupert Wingfield-Hayes says the city is being turned into a virtual ghost town, with streets and office buildings virtually deserted on Monday. Several Asian countries are introducing strict new measures following a meeting of health ministers at the weekend. 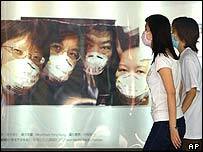 Taiwan has imposed a two-week ban on the entry of visitors from badly affected areas, after the island announced its first Sars death on Sunday. The South Korean Government said it would increase airport checks and free up hospital space, despite the fact it has still not had a confirmed case of the virus. In the Philippines - which has recorded four cases and two deaths - the government said violators of strict new quarantine laws could be detained by police. An estimated 200 people in one town, where a nursing assistant died, have been placed under mass quarantine. Cases in Singapore appear to be declining, with the imposition of stringent measures including thermal imaging of air passengers to detect those with high temperatures. Asia's strict new measures are not over the top but "prudent and necessary", WHO Director-General Gro Harlem Brundtland said on Sunday. Asked on the BBC's Breakfast With Frost programme whether Sars was the "first global epidemic of the 21st Century", the WHO director-general replied: "Yes, this is correct. It will historically be seen that way." But she said the world still had a "window of opportunity" to avoid the virus becoming endemic. "China is still struggling to contain this crisis"